When I was born, Guinob-an had about 150 families living under coconut trees on a narrow strip of land between the Leyte Gulf to the south and jungle covered hills on the inland side to the north. Most of our houses were raised about 6 feet off the ground and made of nipa and sawali, which is woven bamboo, or a combination of sawali and plywood. Footpaths and a rough, unpaved coastal road, that was forever a work-in-progress, connected the barrios. The village had a two-room school, an outdoor basketball court that was also our town plaza, and a little stage for school programs to be held. There was a Church near the school—and that was it. Other than that, it was just simple seaside homes, most of them like ours. Inay Sylvestra’s house was still our home. It was small and square and made of a wooden frame, sawali walls, and corrugated roofing. Like most houses in our village it was built above ground on wood posts and had a porch facing the sunrise, as is our tradition. It had wooden floors that became shiny over the years from so many bare feet walking on them. There was a bedroom separated by an interior wall made of rapak—small, skinny, bamboo-like sticks, each nailed to the floor. The bedroom was for the children, and that is where I slept on a grass mat with my brothers and sisters. The main room of the house (the sala) was where, at the end of the day, the parents and Inay would pull out sleeping mats and sleep on the floor with whatever over-flow kids or grandchildren didn’t fit in the bedroom. In the sala there were two benches beside the windows, which were wooden flaps with a pole to prop them open; otherwise there were no furnishings inside the sala, which made sense because we had to keep the floor clear for sleeping at night. There were kerosene lamps at the end of the benches; these were the only lights in the house. There was also an attached dining room with a big table and benches that could seat twelve people, more if we squeezed together. Also inside, there was an area for washing dishes using jugs of water. Then down two steps, there was an attached shed for cooking, which was done using firewood. During the daytime the “bathroom” was the surrounding bushes and jungle; at night there was a hole in the floor at a corner of the house, which the kids could use but the adults would go outside at night too. Families lived by catching fish and growing crops. We used most of the fish and vegetables for our own families, but it was important to have some extra to sell to other families to get a small amount of cash for the few cash purchases that were necessary: rice, oil, sugar, salt, kerosene, batteries. These could be purchased from one of several tiny sari-sari (variety) stores attached to a few of the houses in the village. There was an open-air dry market in Lawaan where shorts, flip-flops, t-shirts, simple dresses, and school uniforms could be purchased. Many of the families had farm plots in the hills where coconut trees grew; underneath the coconut trees, other crops were planted between the trees. The coconuts provided the main source of income; root crops and other items grown in the shade were mostly for family consumption, although some grew enough to sell them. Life in Guinob-an in those days was simple and very inexpensive. There was no mortgage or rent to pay because our homes had been handed down for generations; there were no utility bills to pay because there were no utilities; no electricity, no running water. There was no fuel cost because we had no vehicles except for boats, which were powered by either wind or muscle or both. There was no insurance because your insurance was your family who would take care of you if you became sick or disabled. At home, my mom cooked on an open fire in the yard by the back porch where there was a small pantry/dining area with a long dining table, big enough so that 12 could eat together. This table was the main place where people would “hang out;” the sala was mostly for sleeping. At that table we ate our meals of fish, rice, and vegetables, or just rice and vegetables when fish wasn’t available. Sometimes neither fish nor rice was available, and then our food was mainly root crops. But fortunately most of the time there was rice. My most vivid memory about food was that when my mom boiled the rice in a big pot over an open fire, the bottom layer of rice in the pot was usually burned, creating what we call totong—a crispy, brittle, burnt shell. Every time, I would scrape the totong from the pot for myself. It was so tasty! We got water from streams and from a pump well by the school. The well was a long way for us to walk carrying the heavy water jugs, so we preferred the stream, which was closer and was clear and clean and flowing down from the mountains through the jungle and over rocks, with a small waterfall. Higher up in the hills, there were beautiful, magical waterfalls; the largest, Amandaraga Falls, is one of the most beautiful places in the world. There are dozens upon dozens of beautiful waterfalls in the interior of Samar as mountain streams rush down to the sea. I don’t remember any vehicles in the town when I was small; many families had a small boat, and these were the only means of transportation for most families other than walking or riding a bicycle along the paths that connected the villages. One of my earliest memories is of going with my mom late in the afternoon to the creek, as the sun was going down and the heat was fading, to catch crabs and other creatures. There were large clams that were not pretty but were very tasty. Then there were crabs. The alimango were the first choice—fat, tasty, they look like Dungeness crabs but not as big. You get them in the mud; they are underneath the rocks or in the mangroves. When we saw an alimango, my mom would just grab it. You have to be careful, avoiding the pincers by grabbing it from the back. My mom was an expert. There was another type of crab—tutut—a small one, its body the size of a child’s palm, that didn’t have much meat but had plenty of tasty fat and was great to eat with rice, especially when there wasn’t much else to eat. When my mom and I would go crabbing for tutut, the system was that Nanay would use a sock over her hand and stick her hand, covered with the sock, down into a mud-hole where the crab lived. The crab would grab the sock, then my mom would pull it out until the crab’s pincer would detach from the body. Then she would stick her hand, still in the sock, down the crab-hole again. The crab would grab it with the other pincer, and mom would pull it off too. “Okay, you can get the crab now,” she would say to me, and then I would poke my small, thin kid-size arm down the hole to get the crab body that Nanay’s arm was too big to get. “What if there’s more than one crab down there?” I thought but I never said anything. We would stay long enough to get a half-bucket of the tutut and that, with rice if it was available, would feed the family for the evening. 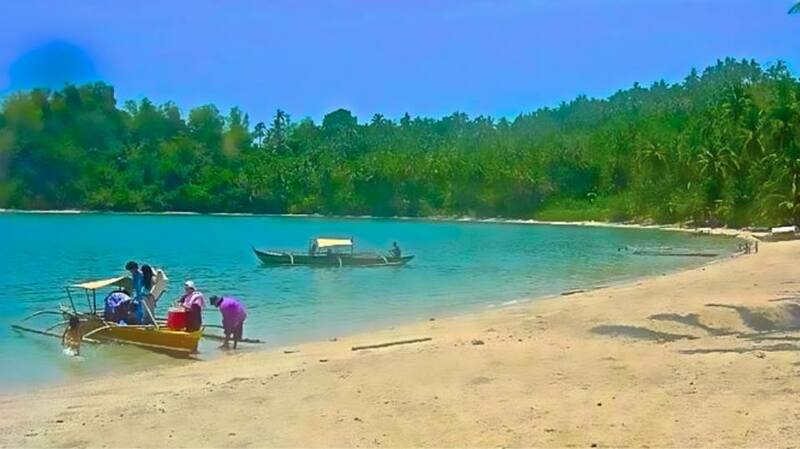 Guinob-an is a fishing village, and when I was growing up my father was a fisherman, one of the best in the barangay. Each day, when the weather allowed, my father would paddle out to sea in his binigiw (a small one-man boat powered by paddle and sail) leaving very early in the morning when it was still dark, bringing home different kinds of fish depending on the season. A binigiw is a type of native boat or baloto. It is made from the hollowed out trunk of a tree with bamboo sides, which we dry and waterproof with tree sap. 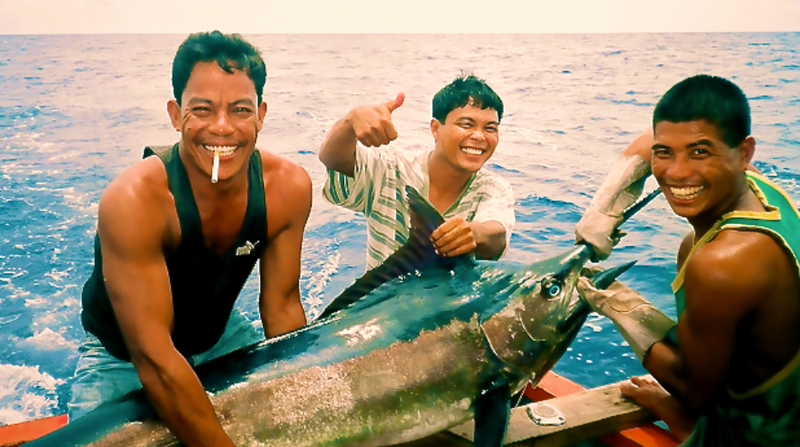 The most exciting time for fishing was April and May, when he would fish for malasugi and salasugi—blue marlin and sailfish. During that time of year the great fish were plentiful just a few miles offshore. I was very curious how he could catch such big fish alone in his tiny binigiw, and he told me stories about how he caught them on hand-lines using baits tied to floating drums. He would put out half a dozen baits and watch them. When a malasugi or salasugi would take the bait, it would cause the floating drum to suddenly dive beneath the water, and then he would chase it, paddling as hard as he could until he caught up with it. He would throw a line over the drum and pull it in and hold on tight. A big marlin could pull his tiny binigiw a long way. When he finally won the battle, which could take hours, he would lash the fish to the side of the boat and paddle home, and then we would clean it on the beach. I would see him coming in with the fish tied to his boat and would run to the shore and wait for him, and jump excitedly as they dragged the huge fish that was many times bigger than me onto the shore. Many, many years later, after I was living in America, I would discover The Old Man and the Sea by Ernest Hemingway, and as I read it I felt that Santiago, the old man in the story, was almost like my dad. I remember Tatay and one brother, Ronnie, would paddle out at two in the morning to fish, then paddle or sail back late in the afternoon around two or three. My Dad would carry with him a small baon pot of rice and some vegetables, sometimes some grilled fish or other toppings if they were available and when he would come home I would always race down to the waterfront and jump into the boat, looking for leftover baon. Almost always there would be some. My Dad never ate everything, he always left something for me except a few times when he got caught in rough weather and couldn’t use the sail, and had to paddle all the way out and all the way back. On those days he needed all the rice for “fuel” and I understood. While my father fished, my mother took care of the children. She cooked, cleaned, and took care of a small farm plot which we inherited from Inay in the jungle hills above the village. She also mended clothes, prepared fish for selling in town, and when she could, played cards with some of the ladies in the neighborhood. Our greatest resource was coconut, which grew in abundance everywhere you looked. It provided everything from construction materials to cooking oil (my mother would make coconut cooking oil at home to avoid having to pay cash to buy oil from the sari-sari store.) We especially treasure buko, young coconut taken when the flesh is soft and only an eighth of an inch thick and the water is almost magically refreshing. I remember grinding coconut meat using a kaguran. You sit on the stool and use your weight to hold the grinder steady, then take the coconut halves and scrub them on the grinder ball. Because I was too light to hold it steady, I had to have my niece sit behind me and together we could hold the kaguran down. I also remember that during the coconut harvest at the family plot, I would dig among the piles of coconuts searching for overripe ones that had started to sprout, knowing that these contained a sweet and tasty buwa, a spongy bread-like bulb growing in the interior of the sprouted coconut as it prepared to put down roots. We also make tuba, coconut wine, from the sap of the coconut flower. My father was one of the best tuba makers, and I was curious to learn how it was done. I was a good climber, so sometimes I climbed the coconut trees to see tuba being collected, and although I never learned the details, what I did learn is that my father would climb up the tree to the flower and then cut into it, then position a lakub, or section of bamboo, which forms a tube-like jug and holds about a quart of liquid, so it would catch the sap. He would do this in the morning, then check it at the end of the day, and usually harvest it the next morning, full of sap. He would then take it and mix in ground up pieces of bark. After that I’m not sure exactly what he did with it, but after some time he would end up with containers of tuba that he could sell, and I know that his tuba was very popular. Most days we would go to bed shortly after sunset and get up right around dawn. Kerosene was expensive and daylight was not to be wasted. One of my most vivid memories is how, on the nights when there was a full moon, the family would not go to bed shortly after dusk, but would, along with other villagers, stay outside, the parents talking and the kids playing in the bright tropical moonlight. I suppose Guinob-an was a poor community but it never occurred to me to think of it that way. I didn’t understand that there was any other way to live. Besides, we were right beside the beautiful Leyte Gulf, there were coconut trees everywhere, and guava trees, and mango trees, and the climate was tropical so we didn’t have great need for clothes, shoes, heating; and everywhere there were brothers and sisters, aunts and uncles, cousins and grandparents, all adding up to abundance in all the things that mattered.